Every 1000 node won we get at the next GW one node less. The time sink gets less and less, but you have to do something for it. Rewards stay the same, but you have to complete 11000 nodes to get one node with full rewards. i'd rather get an additional node every 1000 nodes cleared tbh. Same here. More credits, more gear. More fun. I have to agree with the above why get less the more successful you are? If they do this it should also remove the nodes from the bottom up. You complet 1000 nodes and next GW you get in node 11 the rewards for 11 and 12. Same rewards for less time. If they were to do this it would need to be, you start at node 2 and get the box for free or you get the rewards in node 12. 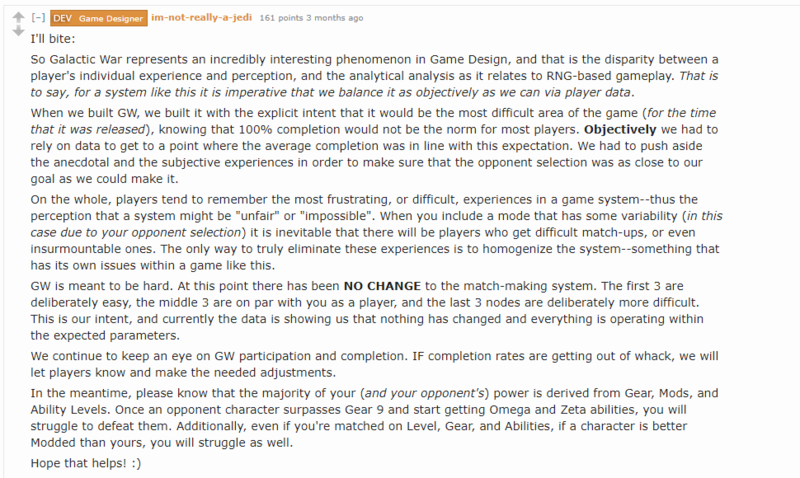 But GW is stated to be a challenge and there is no reason to decrease the challenge like that. I know what you meant. I just happen to like GW. Every new update you see people complain about the needed time. GW is the oldest one and could be reduced for the new stuff, but not for free, like every 1000 nodes. according to this, it is meant to be hard, not made easier. Same here. Sick of simming everything else in this game. Give us more nodes to get more credits, more gear and more fun. Ahh, the classic "game design is hard, so we went with the easiest solution" and "you'll like what we give you" responses wrapped into a single post. A self evolving (through lvl and toon increase and Development) game mode that is relatively hands off and changes as the meta evolves with 12 nodes that will for at least 75-85% be distinct teams.... yeah that's the easy way out.